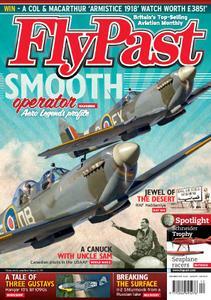 The December issue of FlyPast magazine features a special report on British warbird operator Aero Legends. Based at Headcorn in Kent, and also operating from Sywell in the Midlands, the company offers passenger experience flights in many of its fleet, including a pair of two-seat Spitfires. FlyPast editor Chris Clifford visited the team on an away day at Duxford and describes an exhilarating flight in the backseat of one of its legendary fighters. The company is now taking bookings for 2019. We focus on the iconic Schneider Trophy air races which captured the public imagination, especially during the inter-war years. We feature the stories of British and Italian teams as they attempted to out-do each other in the quest for victory. An Il-2 Shturmovik was recently raised from a Russian lake and is to be restored to fly. Mark Sheppard describes its history and outlines exciting plans for its future. The return to flight of three Messerschmitt Bf 109Gs at Germany’s Air Fighter Academy is detailed by Richard Paver, who also heads out for an incredible photo sortie. Tod Nicol, producer of a documentary on RAF Habbaniya in Iraq, outlines the remarkable history of the RAF’s most prestigious overseas airfield. We also profile the MOTAT museum in New Zealand, home to an impressive array of historic aircraft, including two British flying boats. We include reports and images from recent warbird shows at Duxford and Cosby and detail the history of the ill-fated Arado Ar 240, a German war machine that promised much but failed to deliver. We also bring you news of the move to Wales of Phantom ‘Black Mike’ and the amazing recovery of a Messerschmitt Bf 109G from a lake. Does the December 2018 issue include a mention or article on the discovery of a sunken Bristol Freighter in a Yukon Lake?? My son did the flying on that project. I remember when that happened back in 1969. I have been unable to obtain a copy of that issue of FlyPast at our local magazine store.